As a child back home in Afghanistan, Hussain Sadiqi idolised martial arts icon Bruce Lee. Today, with two shaolin kung fu Afghani national championship wins under his belt, the 27-year-old has trod faithfully in his hero’s footsteps inside the ring—but that’s nothing compared with the metaphorical fight he’s faced away from it. An Hazara and minority Shi’ite Muslim, Sadiqi fled Afghanistan and the Taliban’s violent regime in 1999, eventually travelling by boat to Australia with 147 other asylum seekers. After landing on our shores, they were dispatched to the Port Hedland detention centre, where Sadiqi was incarcerated for six months. During our interview, in a bustling inner city café that seems a world away from that oppressive place, Sadiqi’s dark eyes shimmer as he recalls the experience. "We were punished in Afghanistan because of our religion, and escaped to Australia to find freedom," he says. "But when I came to Port Hedland and saw that camp with the fence around it and the chains and lock on the door, I thought, ‘This is not the freedom I was looking for.'" It’s a painful and all-too-familiar story, but Sadiqi is not willing to play at being a victim. The quietly spoken migrant eventually won his freedom and, during the ensuing years, set about building a new life. 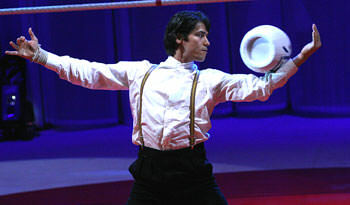 Today, he is fresh from a year of study at the National Institute of Circus Arts, where he’s been honing his martial arts skills while broadening his performance horizons, culminating in an acclaimed performance alongside fellow students in NICA’s end-of-2006 show, the Federico Fellini-inspired DiVino. "I learned a lot about performing," says Sadiqi, whose role in DiVino comprised the enigmatically titled 'Flying Fork' feat (which fuses martial arts with acrobatics and juggling), as well as an a cappella vocal solo. "I’d love to be in a movie eventually, especially an action movie, and DiVino gave me good insight into how people perform, and how they use their ability to express themselves." For most people, an aspiration toward action movie stardom would sound like a pipe dream, but given Sadiqi’s martial arts expertise (he also came within kicking distance of competing in both the 1997 kung fu world championships and the 2000 Sydney Olympics), for him it has the ring of a genuine career goal. In truth, and sturdy physique notwithstanding, Sadiqi, with his mop of black hair, rugged features and grin-full of white teeth, looks as much 'exotic leading man' as 'action hero'. His emotional complexity is also evident, and during our interview his eyes intermittently gleam with the intensity of hope, joy and, more than once, sorrow. "In Afghanistan, when people go out, they are not sure they will come back safely," he reflects. "But when they are home with their family, they have peace in their hearts. In Australia, when I go out, I’m sure I’m coming back safely. But when I come home, there is nobody. I don’t have peace in my heart." Sadiqi’s father, brother and extended family members, he reveals, currently live as refugees in Iran. He also has two sisters who remain in Afghanistan, one of whom has been out of contact with her family for a disquietingly long time. "If one day I could bring my family together again, that would be peace for me," says Sadiqi. It’s clear that for Sadiqi, family is high on his list of priorities, so it comes as little surprise to learn that when forced to choose between their wellbeing and his studies at NICA, the former won out. Sadiqi is financially responsible for his father and brother’s family and, finding it increasingly difficult to balance study and work, this year he has had to discontinue his circus arts studies. "Sometimes I envy Australian guys, as they are able to concentrate only on their own life," says Sadiqi. "But I’m happy to do good stuff for my family. When I was a kid my father worked hard to look after me; now he’s getting old, and it’s my responsibility to look after him. It’s an honour for me to do that." Like all the blows life has dealt him, Sadiqi has absorbed this one with a characteristic quiet dignity. For someone used to training in a converted animal shed in Afghanistan, with a concrete floor and a ceiling that would drip mud when it rained, the facilities at NICA were nothing short of a luxury. He’s sad to leave the school, but grateful for every opportunity that comes his way. Sadiqi has applied for Australian citizenship, and added a physiotherapy degree to his list of goals. If his life has been a fight, he’s certainly not ready to throw in the towel. As his hero, Bruce Lee, declared: "A fight is not won by one punch or kick. Either learn to endure or hire a bodyguard." For Sadiqi, those are words to live by. Recent articles by Tim Kroenert. Association is the mechanism used by the advertising industry to sell its products, and we are all susceptible to its influence. We need to understand the psychological processes that inform us as we come to judge not only parties and policies, but individual politicians. Those who are rejected by their peers live their lives on the edge, in much the same way as others whose lives are upturned by bushfires. In the end, they are often richer for the experience.